Cinnamon Bones - quick Halloween breakfast! Use refrigerated cinnamon roll dough to make a quick and spooky breakfast! 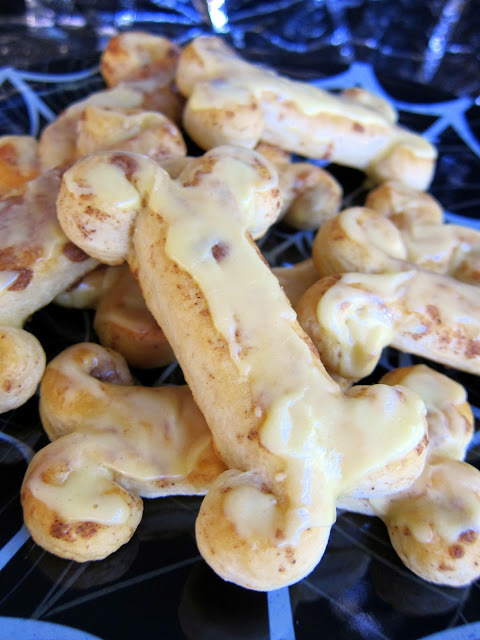 I am kicking off my Halloween treats with these Cinnamon Bones. They are easy to make and a lot of fun to eat! The best part of this recipe? Only one ingredient! You can't beat that! I used a can of my favorite orange rolls, but regular cinnamon rolls would be good too. I unrolled each orange roll, cut it in half and shaped the bones. I had all the bones ready in the time it took my oven to preheat. 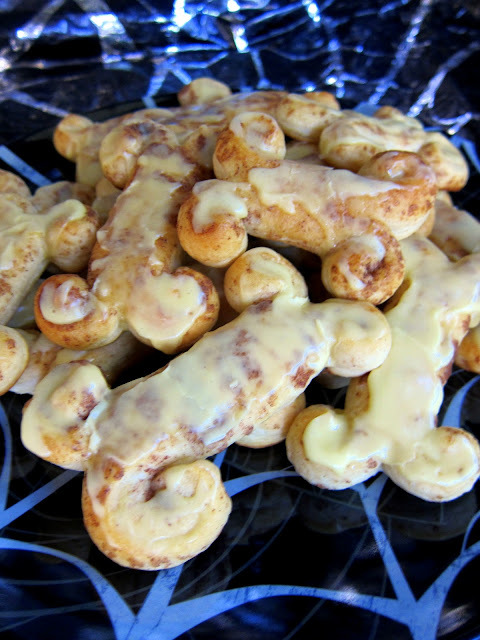 These Cinnamon Bones are the perfect Halloween breakfast treat for your little (or big) goblin!! Separate the cinnamon rolls and unroll. Cut each unrolled cinnamon roll in half to make 16 pieces of dough. Cut the ends of each cinnamon roll strip about an inch down the middle roll. Roll or shape the resulting four flaps of dough into knobs that look like the ends of a bone. Bake 12-15 minutes. Frost with icing that was included with the rolls. Flipping AWESOME! I love a fun activity like this that I can do easily with my kiddo. That's a very cute idea. My hubby luvs those. Oh my goodness my son would go nuts for these but, my hubby would love them. He loves those rolls.